The Skyraider had its baptism of fire over Korea, but it really came into its own during the early days of Vietnam. The AD-6 and AD-7 (redesignated in the early 1960s as A-1J and A-1J, respectively) were able to bring close air support (CAS) to a new level of precision and persistence thanks to the aircraft's range and array of weapons carriage capabilities. 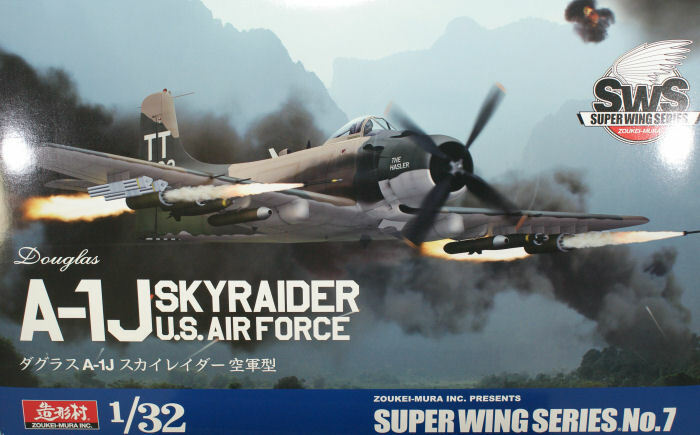 One year ago, Zoukei-Mura released their beautiful 1/32 A-1H Skyraider kit featuring US Navy markings. Their concept was to provide a highly detailed kit in styrene and offer resin and photo-etched upgrades separately to keep the retail price of the basic kit as low as possible. We reviewed the A-1H kit here. Here we are a year later and the 1/32 A-1J Skyraider has been released, and as you would expect, this release is essentially the A-1H kit with one new parts tree, one new decal sheet, and a supplemental instruction booklet describing the differences in assembly between this release and the original A-1H kit. The original A-1H instruction book is also provided. The images to the right are from the A-1H review except for the new parts tree at the bottom. In this new release, all of the parts trees are molded in light gray styrene instead of the different colors rendered in the first release. Both instruction books are printed to resemble the NATOPS flight manuals for the A-1H and A-1J though they are entitled ZATOPS Modeling Manual. The instruction books are well-illustrated with color photos and CAD drawings with text printed in Japanese and English. A correction sheet is also included to correct some parts identification errors from their original A-1H release. The only real difference between the A-1H and A-1J was a slightly more powerful R3350 and stronger landing gear for a greater take-off and landing weight (useful load). If you want to arm this aircraft, you'll have to obtain the separately packaged armament set from Zoukei-Mura, rob some weapons out of a Trumpeter Skyhawk kit (or one of their weapons sets), or look to Fisher Models and their weapons sets. For those who might want to build this kit in USAF service, you'll have a little more work to do. The main difference between USN and USAF Skyraiders was the pilot's seat. Navy Skyraiders didn't have ejection seats. The USAF wasn't thrilled about that when they adopted the type for CAS duties and aircraft was modified to accommodate the Stanley Yankee ejection seat. This release has two decal sheets included, the original A-1H sheet and the new A-1J sheet with USAF markings. The USAF sheet also includes the tail code TC (1 SOS) along with a set of generic tail numbers to provide the option of rendering other examples out of the 1st SOS or 602nd SOS. If you purchased the A-1H kit (like I did), you now have the additional notes and corrections to render that kit in USAF configuration and you can easily do this kit as a USN A-1J, or perhaps do both aircraft from the same service. This kit is still a beauty and though the price has gone up by about $26 USD over the original A-1H release last year. I am really hoping that Zoukei-Mura does follow through with the A-1E Skyraider they'd discussed a number of months ago. It's time to dig out my copy of 'My Secret War' by Richard Drury and get more inspiration to build these as special operations birds.